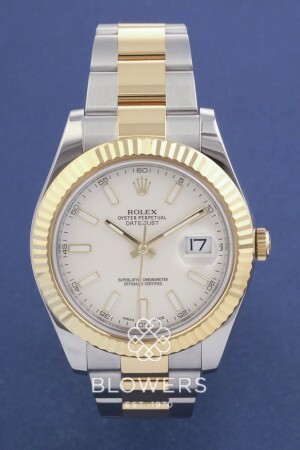 Gents bi-metal Rolex Oyster Perpetual Datejust II 116333. Polished steel 41mm case water resistant to 100 metres. Automatic chronometer movement. Ivory dial with Index hour markers. Fluted bezel. Bi-metal Oyster bracelet. Box and papers dated December 2014. SKU: 3009160. Categories: Datejust & Date, Gents, Rolex.